One year ago Japan was relegated from the Division I Group A with zero points and a 7-26 goal record in five games. Ukraine may do slightly better this year but after starting with four losses the home team won’t be able to improve from sixth place and will have to go back to the Division I Group B. This is certainly not what the hosts were hoping for on their home ice in Kyiv but it mirrors the difficult situation for the country and in general since violent acts in Crimea and Eastern Ukraine destabilized the country and its economy. Its big neighbour Russia also has a big influence in hockey. Until 2014 relations were better and Donbass Donetsk played in the Russian-based Kontinental Hockey League. The KHL as the best league in Eastern Europe has always attracted the best Ukrainian players with good salaries and little language barriers and having a KHL team in the country was a good thing for them. Since separatists took control of areas in Eastern Ukraine and destroyed the ice rink in Donetsk owned by a pro-Ukrainian businessman, little fittingly for these days called Palace of Sports Druzhba (Friendship), the KHL team ceased to exist and after a one-year break HC Donbass relaunched its operation in the government-controlled part of the Donbass region in Druzhkivka and won the last two Ukrainian championships. For top players that meant moving to other teams namely in the KHL. This caused the next problem for Ukraine. The Soviet-born Ukrainian players can have citizenship in Russia too by law and thus want to play as Russians in the KHL rather than being part of the import contingent. But by the rules in the KHL, Russians with another citizenship only count as Russians if they don’t play for a national team from another nation. This rule had a massive impact on this year’s roster. Goaltender Sergi Gaiduchenko and forwards Olexander Materukhin, Pavlo Padakin, Olexi Ponikarovsky, and one tier below the KHL Yevgen Belukhin are some of the country’s top player that were missing due to this rule. But that’s not all. Andri Mikhnov, who had 85 scoring points in the Belarusian league this season, couldn’t come due to injury, same for Oleg Shafarenko, one of the top centremen of the country, and defenceman Denys Petrukhno. One of the country’s top prospects, Igor Merezhko, went the other direction than other Ukrainian players abroad and is busy in the playoffs of the Western Hockey League with the Lethbridge Hurricanes. That leaves Ukraine with a roster exclusively from the domestic UHL, mainly from two clubs, HC Donbass and HK Kremenchuk. But playing internationally against teams like Kazakhstan and Korea is hockey at a very different level. Ukraine didn’t look out of place. All games were lost by one or two goals. Its scoring efficiency wasn’t good, only Poland had more trouble converting chances. Only one of 20 power plays ended with a goal for the Ukrainians while the penalty kill was statistically the worst of the tournament as well. But Ukrainian hockey can also draw positives from this tournament. Many players from the Ukrainian team are able to compete. Some may be able to play at a higher level elsewhere. And the Palace of Sports, the country’s most important and storied indoor sporting venue in the centre of its capital, got back ice hockey at the site where many IIHF events took place in the past and where now-defunct Sokil Kyiv was once playing for medals in the Soviet championship. The arena was full for most of Ukraine’s game and had descent attendance for other games thanks to locals who show genuine interest in hockey and fans from other countries who travelled to Ukraine to loudly support their team and create a hockey party at the arena and around it with a fan zone and music on the stage. Playing in the heart of Kyiv is important since there’s no club team in the city (but around it) anymore. Now the Ice Hockey Federation of Ukraine (FHU) plans to expand to a new city, Odessa at the Black Sea. The All-Star Game of the newly created women’s league was the first national ice hockey event at the city that gained in importance for domestic tourism after Russia’s annexation of Crimea. Now the federation applied to host the 2018 IIHF Ice Hockey U18 World Championship Division I Group B there in competition with bids from Austria, Hungary and Italy. The support was not only heard at the arena. Ukrainian politicians and athletes took the opportunity to watch the games at the Palace of Sports as hockey was back in downtown Kyiv. And the TV ratings were great including 13 million watching the 1-0 loss against Austria, about one third of the population. These are all encouraging signs that will hopefully help make hockey bigger in the country that played in the top division between 1999 and 2007. It’s been a tough week for the Netherlands. With the country’s top team, Tilburg Trappers, still in German playoff action, head coach Chris Eimers is forced to go with a young roster and hope that some of his more experienced guys can get to Northern Ireland in time to help the team’s bid to stay up in Division IB. But crisis brings opportunity: that youthful line-up gives a chance to run the rule over the next generation of Dutch hockey talent. Among the youngsters who are growing up fast here, 20-year-old Guus van Nes has been one of the most eye-catching. A year ago, he was scrapping for minutes on the fourth line in Jaca as the Dutch took gold in Division IIA. This time, he’s got a spot on the Netherlands’ top line, replacing injured assistant captain Raphael Joly and looking to supply the cutting edge that can preserve his country’s Division I status. And, despite a tough tournament so far – three losses, 20 goals against and just three scored – the Boston Bruins junior prospect is enjoying the added responsibility. That upbeat attitude typifies the Dutch approach to this tournament: dealt a rough hand by the conflicting schedules of club and international competition, Eimers and his team remain stoic – and optimistic. On a personal level, this season has been something of a break-out for van Nes. Coach Eimers was delighted with his player’s progress since Spain in 2016 and insists that the youngster’s current prominent role is on merit, rather than necessity. “Guus really developed last year,” Eimers said. “He was with us last year in Jaca and he did well there, but since then he’s had a really good camp. When the situation arose with Joly [and his injury], we felt that Guus deserved to be bumped up to that line alongside Kevin [Bruijsten]. 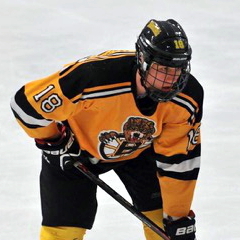 For his part, van Nes credits his progress to a summer of hard work and a big opportunity with the Junior Bruins in the USPHL, a Junior A Tier 3 league. The Dordrecht native is in his third season with the organisation, and this time round he plundered 45 points in 43 games in the Premier Division in his most active and most successful campaign to date. For a young player emerging from a relatively small hockey nation, the Bruins name is also a nice line on the resume – even if it’s some way from the fame and glamour of the world-famous NHL team. “Obviously you don’t feel the whole Bruins history and mystique when you’re playing on a team at that level, but it’s still a good name to a part of and it attracts more people to come and watch, so it’s quite exciting that way,” van Nes added. For now, though, the focus is on Division I survival. “We feel our performance is better than our results and we’ll see what we can do about getting that win,” van Nes concluded.